Smørrebrød (originally smør og brød; Danish for "butter and bread") usually consists of a piece of buttered rye bread (rugbrød), a dense, dark brown bread. 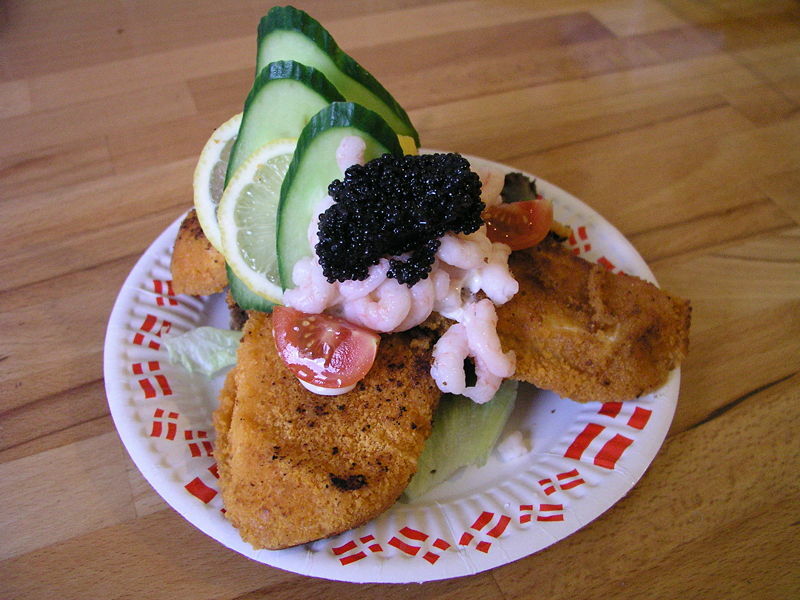 Left: Danish open sandwich (smørrebrød) on dark rye bread (almost covered) with breaded fish, salad, cucumber, shrimps, black-colored lumpfish roe (sort stenbiderrogn) and tomato. The topping can include commercial or homemade cold cuts, pieces of meat or fish, cheese or spreads. This daily practice is the base on which the art of the famous Danish open sandwich, smørrebrød is created: a slice or two of the topping is placed on the buttered bread, and then decorated with the right accompaniments, to create a tasty and visually appealing food item. Bread is a very important part of the Scandinavian table. Smørrebrød is based primarily on rugbrød, which is sour-dough rye bread. It is a dark, heavy bread which is sometimes bought pre-sliced, in varieties from light-coloured rye, to very dark, and refined to whole grain. Traditional toppings include marinerede sild, which are pickled herrings, slightly sweeter than Dutch or German herrings; thinly-sliced cheese in many varieties; sliced cucumber, tomato and boiled eggs; leverpostej, which is pork liver-paste; dozens of types of cured or processed meat in thin slices, or smoked fish such as salmon; mackerel in tomato sauce; pickled cucumber; boiled egg, and rings of red onion. Mayonnaise mixed with peas, sliced boiled asparagus and diced carrot, called italiensk salat (lit. Italian salad), remoulade or other thick sauces often top the layered open sandwich, which is usually eaten with utensils. It is custom to pass the dish of sliced breads around the table, and then to pass around each dish of toppings, and people help themselves.